Every champion needs something to fuel their motivation for another run. For the Golden State Warriors, that fuel has come from the doubters and haters who believe the Dubs lucked out in last year's postseason. To which SI.com's Colin McGowan has a simple, frank retort: Who cares? I apologize for us being healthy, I apologize for us playing who was in front of us. I apologize for all the accolades we received as a team and individually. I’m very, truly sorry, and we’ll rectify that situation this year. That was Stephen Curry speaking to the media last Thursday. It’s not often that defending champs return to work and greet the press with withering peevishness, but the Warriors seem content to forge their own moody path. After Doc Rivers made some quasi-inflammatory remarks about Golden State catching a few breaks in last year’s playoffs, Draymond Green took it as an opportunity to compare Doc to a “bitter female.” Andrew Bogut says he’s getting his title ring fitted for his middle finger. Last month, Harrison Barnes tweeted a photo of himself dunking on LeBron James in the Finals. As a general rule, athletes are hyper competitive weirdos who use the mildest slights as motivation, but even for a group of folks with a vested interest in finding stuff to get indignant about, the Warriors are an ornery bunch. Of course, that second thing simply isn’t true. The Warriors were historically magnificent last season; they had the second-best plus-minus of any squad since 1983; they were an eyelash short of the Clippers in offensive efficiency and led the league in defensive efficiency; they won 67 games and Curry took home the MVP while establishing himself as the greatest pure shooter of all-time. Even in a stacked Western Conference, there weren’t many teams that could get on the Warriors’ level on a night-to-night basis. They put a lot of games to bed in the third quarter. At the postseason’s outset, they were the number one title contender with a bullet. It is true, however, that the Warriors didn’t have a particularly tough time in the playoffs. The league’s faulty seeding protocol meant the Spurs immediately drew the Clippers and got bounced in the opening round. In the Western Conference semifinals, the Dubs played a Grizzlies squad that featured a hobbled Tony Allen and Mike Conley looking like his face got stepped on by a Humvee. The Clippers coughed up a 3–1 lead in the Western Conference Finals to the banged-up and inferior Rockets, whom the Warriors promptly rolled in five games. Then the Cleveland LeBron Jameses gave Golden State some trouble before succumbing to attrition, Curry’s anywhere-in-the-gym range, and a healthy dose of Andre Iguodala. 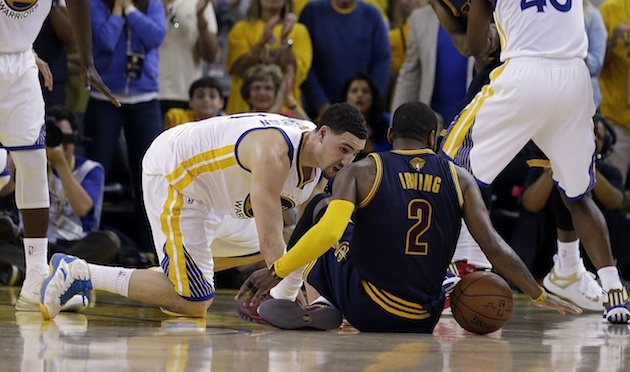 well-played basketball, and the Warriors weren’t sufficiently pushed, due to circumstances beyond their control. There’s no reason for them to apologize for this, facetiously or otherwise, but their title run wasn’t the test nor the spectacle it could have been. It’s eminently plausible the Warriors would have beaten the Spurs, or the Clippers, or a full-strength Cavs team. That they didn’t doesn’t make their championship any less legitimate; it was just a bit easier to attain than many observers would have liked. 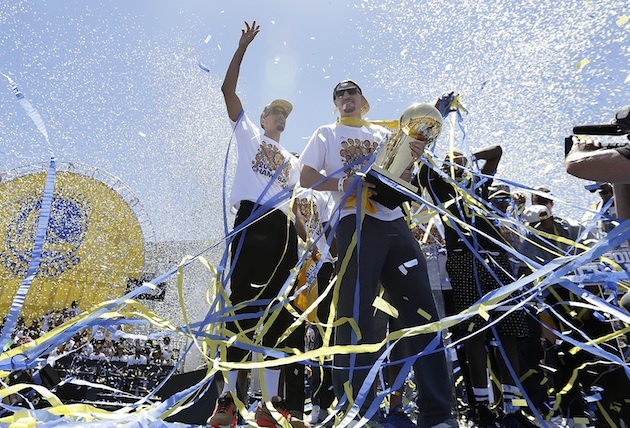 2015–16 NBA Finals predictions: Who will win the championship this year? ​Pair these completely reasonable caveats with a majority of NBA general managers picking the Cavaliers to take home this season’s Larry O’Brien trophy, and apparently you’ve got the most aggrieved title defenders in quite some time. It’s like some five-year-old who is playing pretend chemist mixed Pepto Bismol with blue food coloring and somehow created a new plague. Klay Thompson, who until recently had the machismo of someone who had just walked into the wrong lecture hall, is out here, making his toughest and you can print that! face to assembled reporters, talking about how the Clippers “couldn’t handle their business.” The Warriors have gone Full Wounded Genius over nothing. This is presumably a little bit calculated. The Warriors spent the summer enjoying their success, and now they need to indicate, both to the rest of the league and themselves, that it is serious business time and you come at the king you best not miss and we’ve got the championship belt, etc. If you look at the Dubs’ last couple weeks of hater-dismissing and bravado-peddling as a group of dudes searching a bit too hard for motivation and lapsing into delusional wrestling heel-speak, it becomes more intelligible, if not more bearable. They are not actually this angry; they just like to think they are. The reason sports are so culturally pervasive concerns our fascination with the human body in motion and a desire to escape the banal. But they are also popular, on a less high-minded level, because they are about supremacy. An abundantly absurd supremacy, to be sure. In essence, sports are pointless activities — one party trying to outdo another at a task that absolutely does not need to be done. But that fact doesn’t dissuade some people from seeing sports as a way of engaging in egotistical proxy wars with others. Club allegiances are bound up with civic pride and antipathy. They are at the root of heated disagreements and honest-to-god acts of physical violence. They are pretend-important hobbies that are treated as if they are genuinely important by folks who lose all perspective, who believe in a moment of blinkered fan-rage that if the Chicago What-Have-Yous beat the Philadelphia So-And-Sos in a playoff series, it means Chicago’s dad has more money than Philadelphia’s dad, and that cheesesteak consumption will be criminalized. This is the dark side of sports: joyful exercise engendering real, seething anger, transforming otherwise well-adjusted human beings into permanently affronted skin-sacks of hate who conceive of everyone who is not draped in their colors of choice as The Enemy. Perhaps this is why the Warriors’ preseason aggro-boasting is so off-putting. They are evocative of the sad fellow at the end of the bar who is taking a game way too seriously, whooping at every made basket and screaming himself hoarse at every dubious foul call, laying bare the blessed, wretched large-scale meaninglessness of sports by dint of caring about them more than anyone — even the people who play it for a living — ever should. A title is a title, and it’s wonderful: a realization of everything a team that has gobs of talent and works very hard believes itself to be. But it is also just a gold star sticker for a trivial endeavor. Draymond Green can stop insisting upon his team’s greatness as if it were a possession that he’s in danger of losing. No one is going to take anything away from the Warriors, because there really is nothing to take away.